I’m aching. All over. Especially around my hip joints. It’s uncomfortable but doesn’t stop me doing things. I do my pilates classes and today I’m going to sign up for the gym which is practically next door to us so I can swim a little more often than I currently do (I watch H). I consulted the Google Doctor who diagnosed everything in the world ever, but one thing stood out and right now something needs to be done. 1. Lose weight. This is still going well – the weight is staying off since I worked with Weight Watchers last year and have continued with Porridge On Tuesday this year. My Fitbug Air is disappointed in me as I haven’t managed any aerobic steps in the last week. We have been getting outside and getting walks in the fresh air, I need to do more. My running shoes give me great support for my lower back and make it so much more comfortable to do. 2. Pain relief. I’ve just ordered some Devil’s Claw from Healthspan. This is good for pain relief for achy joints, and I’m willing to give it a go. 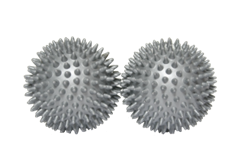 I’ve also ordered some spiky balls from my pilates teacher as they work a bit like reflexology and do get rid of my back pain by standing on them (how I wish I had some now, but Monday will be here soon enough). 4. Think about visiting the doctor. See, all signs point to the Big M Word which is on the horizon. I’ve been trying to ignore it for a while now, but you know how you’re trying to do a puzzle and nothing quite makes sense until you see what looks like the solution over in the distance, and it’s the thing you’ve been purposely not thinking about. I’m holding off for as long as I can – at least until points 1-3 have been actioned to see if they’ve helped. Then there’s the rational thinking. 3. H is almost four and a quarter now so doesn’t need picking up as much as she used to (to be fair, Shaun does that mostly, but I do very occasionally) – I just need to work on comfortably bending down to comfort her, which hopefully the pain relief will fix. So yes, M-word I know you’re there, I’m just not quite ready to accept that you are. My mum had an early one, so all signs point to that happening to me as well, so in some ways I’ve been prepared since I was a teenager. Two more weeks won’t hurt. Does a Ching joints signify the beginnings if M then? Really I am clueless! You have done uhmazingly well on the weight loss , keep going! A woman I worked with had a pre M! That alarmed me thinking oh my god it could happen in early 40’s! !